Before :- M. Y. Eqbal, J.
Cr. M. P. No. 1170 of 2004. D/d. 16.2.2010. For the Petitioner :- S.K.Srivastava and Rupesh Rai, Advocates. Criminal Procedure Code, 1973, Section 482 - Indian Penal Code, 1860, Sections 467, 468, 471, 419 and 120-B - C.J.M. taking cognizance of the offence against the petitioner - Police report regarding the presence of petitioner on the date in question at the site of occurrence found to be false because the documents produced show that the petitioner was in Australia during that period - There had been an earlier litigation between the parties in proceedings under section 144/145 of Cr.P.C. - Held that, only civil Court was competent to decide the issue whether the alleged sale deeds were forged or not - Filing of criminal case is an abuse of process of the Court - Entire criminal proceedings and the impugned order of cognizance quashed - Petition allowed. 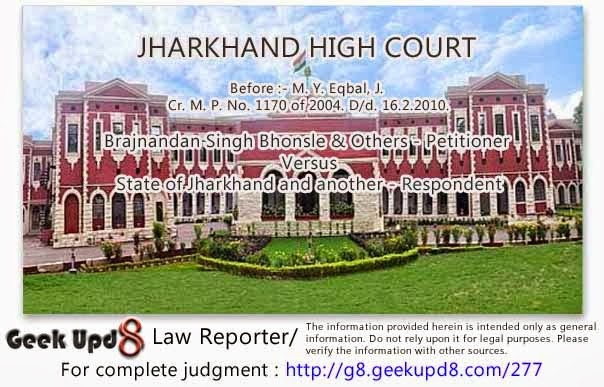 Bhajan Lal's case (1991 (28) ACC 111 (SC) : 1992 Suppl (1) SCC 335). Zandu Pharmaceutical Works Ltd. v. Mohd. Sharaful Haque (2005) 1 SCC 122 : 2005 (25) AIC 379 (SC) : 2005 (51) ACC 188 (SC). Inder Mohan Goswami and another v. State of Uttaranchal and others ((2007) 12 SCC 1 : 2007 (59) AIC 30 (SC). M.Y.Eqbal, J. By this application the petitioners have prayed for quashing the order dated 27-8-2004 passed by the Chief Judicial Magistrate, Ranchi in Bariatu P.S. Case No. 32/2002, whereby he has taken cognizance for the offence under Sections 467, 468, 471, 419 and 120B, IPC., although in the final report the police found that it was a civil dispute related to land and the civil matter is pending in Court. 2. The opposite party No. 2, Professor Satish Kumar claiming himself to be the son-in-law and power of attorney holder of Bhagwan Prasad Singh lodged a complaint against the petitioners alleging, inter alia, that his father-in-law purchased a piece of land through a re-registered deed of sale in the year 1963 from Smt. Indu Rai. After purchase Bhagwan Prasad Singh alleged to have erected boundary wall around the land, constructed one small room and planted some trees. Further allegation is that on 26-10-2001 when the complainant went to see the land he found that wall was broken from the side of the house of petitioner No. 1. The accused petitioner No. 1, Dr. B.N.S. 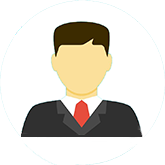 Bhonsle told him that Bhagwan Prasad Singh sold the land to him by registered deed of sale dated 15-1-90 and he showed the deed of sale to the complainant. It was further alleged in the complaint petition that on 28-10-2001 Bhagwan Prasad Singh came to the complainant at Ranchi and the complainant along with him and others went to the petitioner No. 1 at his residence. The petitioner No. 1 showed the registered deed to Bhagwan Prasad Singh. After seeing his signature forged on the deed Bhagwan Prasad Singh asked the petitioner No. 1 as to why he did so. The petitioner No. 1 Dr. Bhonsle alleged to have told in presence of witnesses that all these things have happened at the instance of petitioner No. 3. The complainant, therefore, alleged that the accused persons under the conspiracy managed, executed and signed the two sale deeds, which were registered. The complainant further stated that he got signature of Bhagwan Prasad Singh on the two sale deeds examined by the experts, who reported that the signature was forged. 3. It appears that by order dated 5-2-2002 the Magistrate sent the complaint to the police under Section 156(3), Cr.P.C. for institution of a case and submission of final form after investigation. On receipt of the complaint the police registered a case being Bariatu P.S. Case No. 32/2002. The investigating officer after investigation of the case submitted final report on 30-9-2002 stating that out and out it is a civil dispute. The Magistrate did not agree with the final report of the police and held that it is not a case of civil dispute only and there is a prima facie case and took cognizance of the offence by passing the impugned order dated 27-8-2004. 4. Learned counsel appearing for the petitioners assailed the impugned order of cognizance passed by the Magistrate as being erroneous, illegal and without jurisdiction. Learned counsel submitted that the magistrate while disagreeing with the final report of the police ought to have made further enquiry before taking cognizance of the offence. Learned counsel submitted that after the land was sold to the petitioner No. 1, he got his name mutated in the Municipal Corporation as well as in the office of the Circle Officer, Town Office, Ranchi. Learned counsel further submitted that in the year 1994 the complainant and his associates tried to interfere with the possession of the petitioner No. 1 over the land, which resulted into a proceeding under Section 144, Cr.P.C. against Bhagwan Prasad Singh and the complainant and others. The said proceeding was converted into a proceeding under Section 145, Cr.P.C. in which the complainant and other persons appeared and filed written statement and participated in the proceeding. The Magistrate finally passed order on 9-9-96 declaring possession of the first party over the land and communicated the order to the Bariatu Police station. Various other facts have been pointed out by the learned counsel for the petitioners including that the petitioner No. 1 was not even in India on 26-10-2001 and 28-10-2001. The petitioner No. 1 left Ranchi and took his flight in Calcutta on 5-10-2001 for Australia and came back to India only on 4th January, 2002. Hence, the allegation made in the complaint petition that on the aforesaid two dates the complainant and his father-in-law met the petitioner No. 1 is palpably false. "27-8-2004 Perused the final report submitted by the I.O. of this case numbering as 125/02 in Bariatu P.S. Case No. 32/02, the instant case. It has been said by the I.O. in the final form that final form as civil dispute is being submitted in the light of the observation of the Dy. S.P. Ranchi. I have perused the entire case diary along with the case record. For better appreciation of my order I would like to put some facts of the case in brief. Initially a complaint case bearing No. 1/02 was brought by the complainant with grievance that the land owned by his father-in-law (complainant) holding power of attorney through a sale deed executed in the year 1963, it has been alleged that when on 26-10-2001 the complainant went to see the land it was found that the accused persons are trying to take possession of the land by breaking boundary wall and when an enquiry was made the accused persons informed that they have got one sale deed executed on 15-1-90 in favour of them in Calcutta. In course of investigation the signature of the said Bhagwan Prasad Singh who has been said to be real owner was verified with the signature of the sale deed by the accused persons. The hand-writing experts have given a definite opinion with cogent reason and scientific evidence that signatures upon the sale deed of the accused persons have been forged and fabricated. There are many witnesses in the case diary who have stated that the accused persons with mala fide intention forged the document in order to cheat the complainant and real owner of the land. I find that it is not a case of civil dispute only. Needles to say that a part from the criminal law, if the document is forged in order to cheat the criminal liability also lies and the accused to face the trial criminal liability. As per the discussion, I find that there is prima facie case for the offence u/S. 461/468/471/419/120B, I.P.C. against the accused persons named in the F.I.R. (complaint petition). Accordingly cognizance of the offence as mentioned above is taken and the case is transferred to the Court of Shri Sanjeev Verma, Judicial Magistrate, Ist Class, Ranchi for early disposal." 6. It is well settled by a catena of decisions that power under Section 482, Cr.P.C. is mainly to prevent the abuse of the process of Court to secure the ends of justice. In Bhajan Lal's case (1991 (28) ACC 111 (SC)=1992 Suppl (1) SCC 335) , the Supreme Court very categorically held that power under Section 482, Cr.P.C. can be exercised for the purpose of quashing a criminal proceeding when it is, inter alia, found that the allegations made in the FIR or complaint are so absurd and inherently improbable on the basis of which no prudent man can ever reach a just conclusion that there is sufficient ground for proceeding against the accused where a criminal proceeding is manifestly attended with mala fide and/or where a proceeding is maliciously instituted with an ulterior motive for wreaking vengeance on the accused. "8. ... It would be an abuse of process of the Court to allow any action which would result in injustice and prevent promotion of justice. In exercise of the powers, Court would be justified to quash any proceeding if it finds that initiation/continuance of it amounts to abuse of the process of Court or quashing of these proceedings would otherwise serve the ends of justice. When no offence is disclosed by the complaint, the Court may examine the question of fact. When a complaint is sought to be quashed, it is permissible to look into the materials to assess what the complainant has alleged and whether any offence is made out even if the allegations are accepted in toto." "46. The Court must ensure that criminal prosecution is not used as an instrument of harassment or for seeking private vendetta or with an ulterior motive to pressurise the accused. On analysis of the aforementioned cases, we are of the opinion that it is neither possible nor desirable to lay down an inflexible rule that would govern the exercise of inherent jurisdiction. Inherent jurisdiction of the High Courts under Section 482, CrPC though wide has to be exercised sparingly, carefully and with caution and only when it is justified by the tests specifically laid down in the statute itself and in the aforementioned cases. In view of the settled legal position, the impugned judgment cannot be sustained." 9. In the instant case, the complainant has alleged that on 26-10-2001, he found the boundary wall broken and thereafter, on 28-10-2001, the complainant met with the petitioner No. 1, who showed the sale deed and admitted about the forgery made at the instance of the petitioner No. 3. But it appears that the petitioner No. 1 was in Australia from 5-10-2001 to 4-1-2002. These averments have been supported by the visa and air-tickets. At the same time, it appears that according to the petitioners, the complainant's father-in-law entered into an agreement for sale of the land measuring 19.86 kathas with Shri Bharat Prasad Singh, father of petitioner No. 1, in 1974 for a consideration of Rs. 22,839/-. After the agreement, father of petitioner No. 1 came in possession and thereafter, after a lapse of time, sale deed was executed in favour of petitioner No. 1 in 1990. It appears that the Magistrate has not carefully scrutinized the evidence brought on record and has failed to find out the truth before taking cognizance particularly when the police submitted final form holding that it is purely a civil dispute. As noticed above, before the complaint case was filed, there was first round litigation between the complainant and the petitioner under Sections 144/145, Cr.P.C. Prima facie, it is a clear cut case where parties are claiming right, title, interest and possession over the disputed land, which can only be decided by a Civil Court of competent jurisdiction. The Civil Court is also fully competent to decide the issue whether the document of title is forged and fabricated document, as alleged by the complainant. 10. In the facts and circumstances of the case, finding some of the allegations made in the complaint such as meeting of the complainant with the petitioner No. 1 on 26-10-2001 and 28-10-2001 prima facie appears to be incorrect, the continuance of criminal proceeding will amount to abuse of the process of law. 11. For the reasons aforesaid, this application is allowed and the entire criminal proceeding and the order of cognizance dated 27-8-2004 is set aside. However, it is made clear that any of the observation and the opinion expressed by this Court in the order shall not in any way prejudice the case of the parties in the event the matter is brought to the Civil Court and their claim shall be decided on the basis of evidence that may be brought on record.